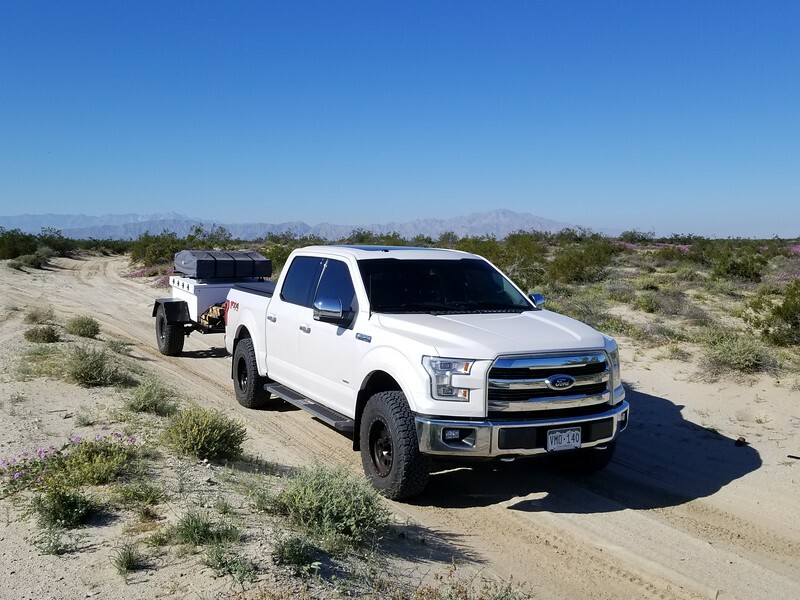 So some quick thoughts .... the truck was amazing, it's a pleasure to drive on the freeway towing the trailer and while offroad, bouncing around and blasting at speed. I was worried about how 'mild' it is, but it turned out to be ideal. The EcoBoost engine is impressive, we averaged 14 MPG on the way down and 12 MPG coming back, facing a nasty headwind most of the time. 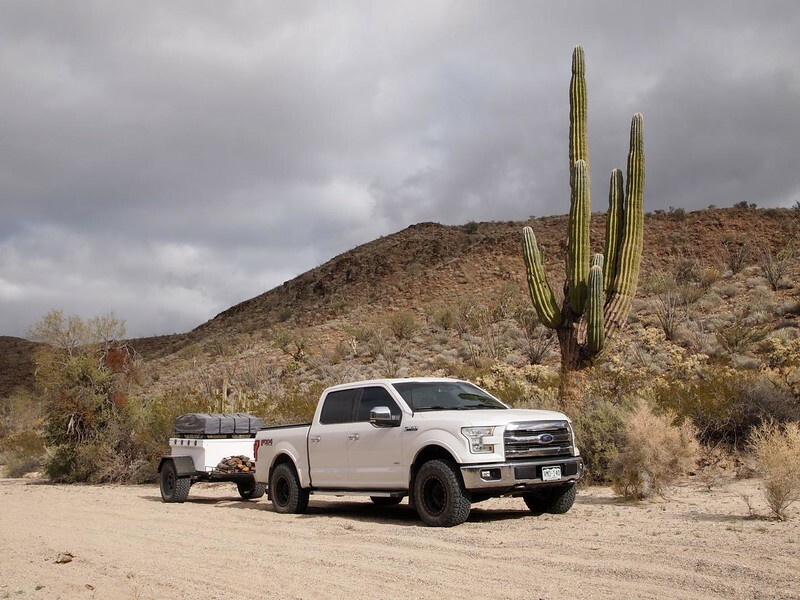 The trailer has enough weight & rolling resistance that the EcoBoost is running with the turbo's spooled up much of the time. I don't really care about the mileage, but LOVED the 36 gallon gas tank. 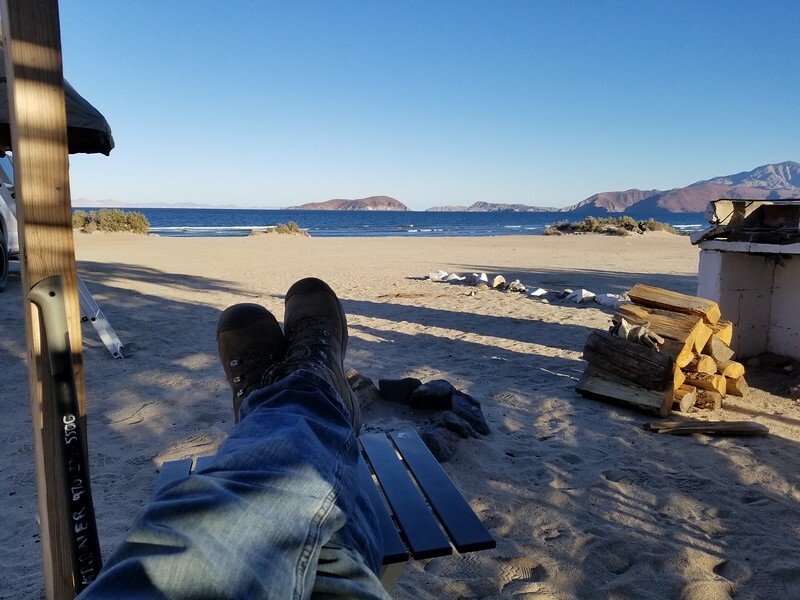 It took so much stress off planning around getting gas in Baja and on the drive down and back. We had 10 gallons of gas in the truck just in case, but never needed to consider dumping it in. On our last 2 days, we drove from Bahia de Los Angeles (8 hours South of the border) and well into California before needing gas again. Last time we went, we took my Jeep which is only good for 220-240 miles per tank. 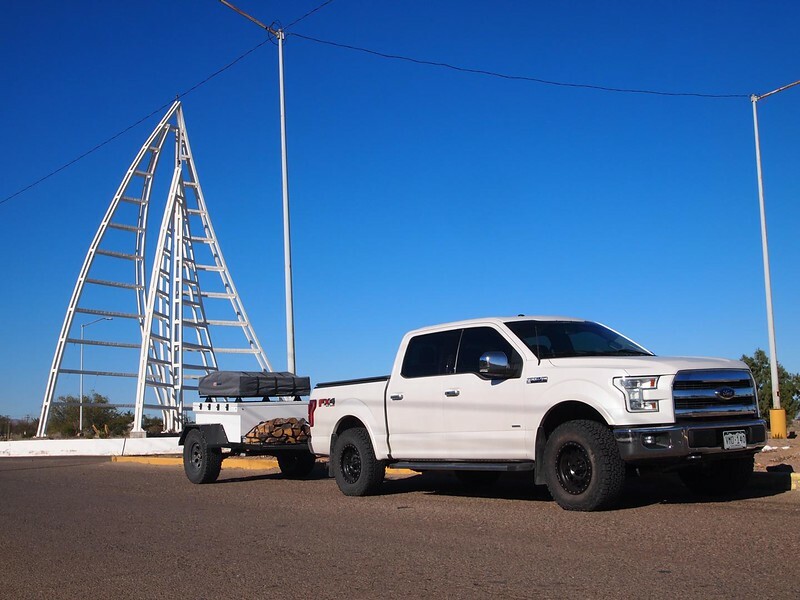 The truck is so easy to drive it makes all the miles pass easily. 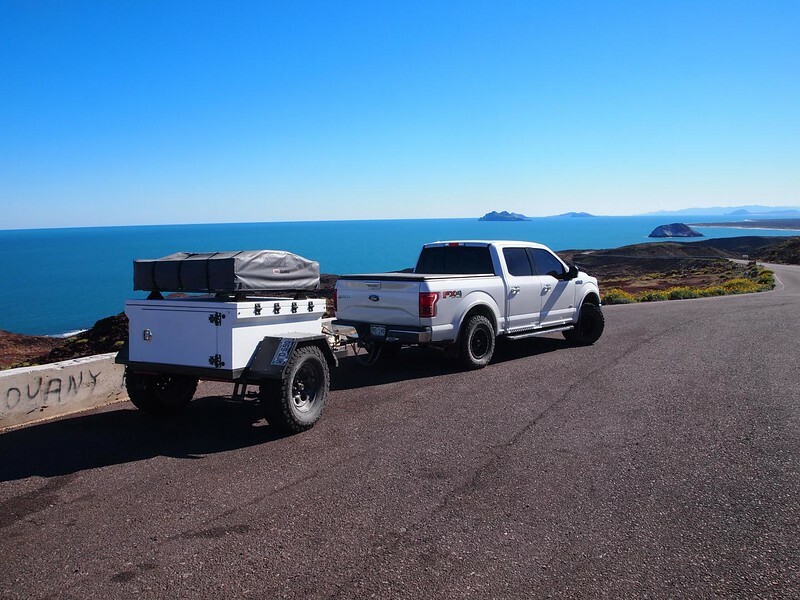 The offroad manners of the truck were simply incredible, even more so when we left the trailer behind and pushed the truck at speed on the sandy Baja roads. 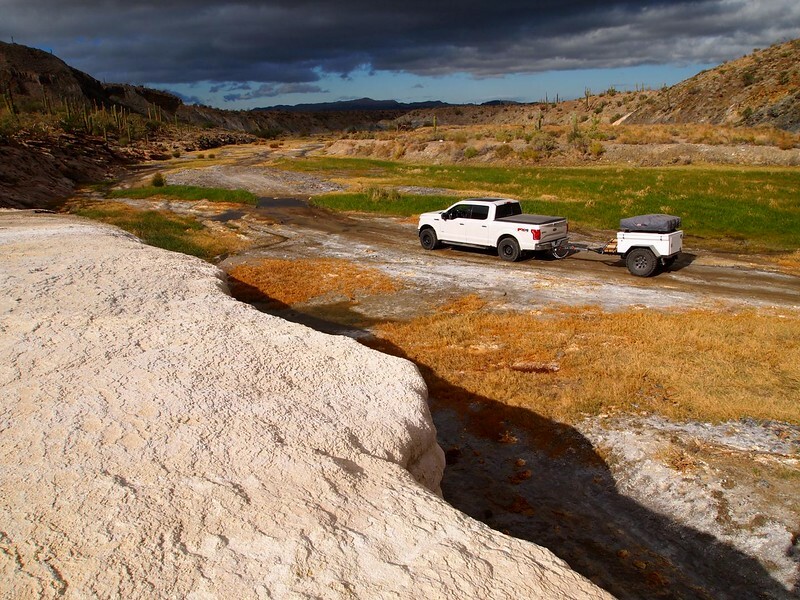 As simple as this truck is with nothing but shocks, wheels & tires it was ideal for a offroad Baja trip. The Falcon shocks add so much control at speed and the BFG KO2's and Method Wheels helped manage the impacts. There were plenty of times when we had the trailer hooked up that I wish it wasn't there.... because we could have covered ground much quicker! It's like this truck was built for this kind of stuff... it excelled in Baja! 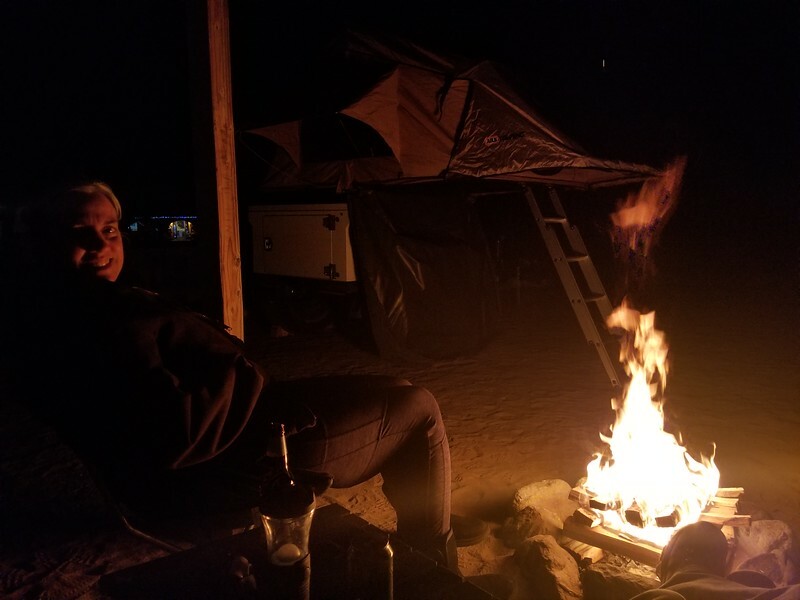 This trip wasn't nearly as extensive as our last Baja trip, my wife had family down in San Felipe and they came down over a few different days and we spent quite a bit of time catching up with family that we don't see often enough, which cut into our travel time. I totally understand though, Family is important and spending time together is very valuable, so I can't complain. 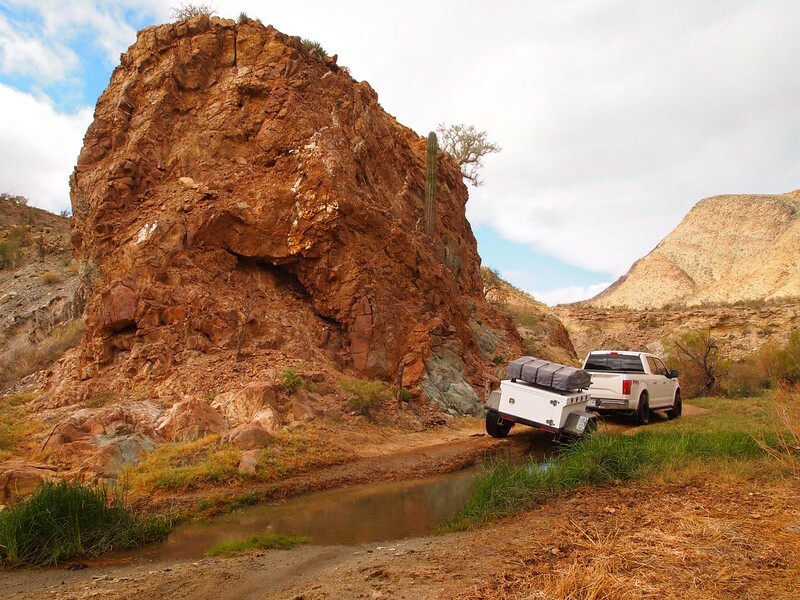 While around San Felipe, we took a quick driving tour thru Valle de los Gigantes (Valley of the Giants). 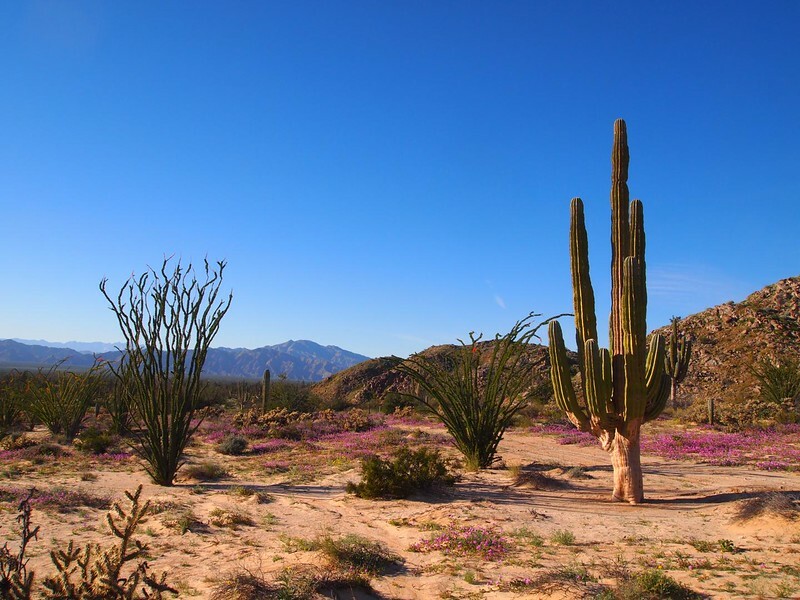 The valley is home to an impressive forest of cardón cacti, the tallest growing cactus in the world. The Verbena were in full bloom, carpeting parts of the valley floor with purple flowers... much of the desert was a brilliant green, the Baja desert looked alive and healthy! The drive thru Valle de los Gigantes is short, but impressive.... highly recommended if you're in the area. It costs $10/vehicle to enter and the the sand on the back-end of the park gets pretty soft & deep, requiring 4WD. 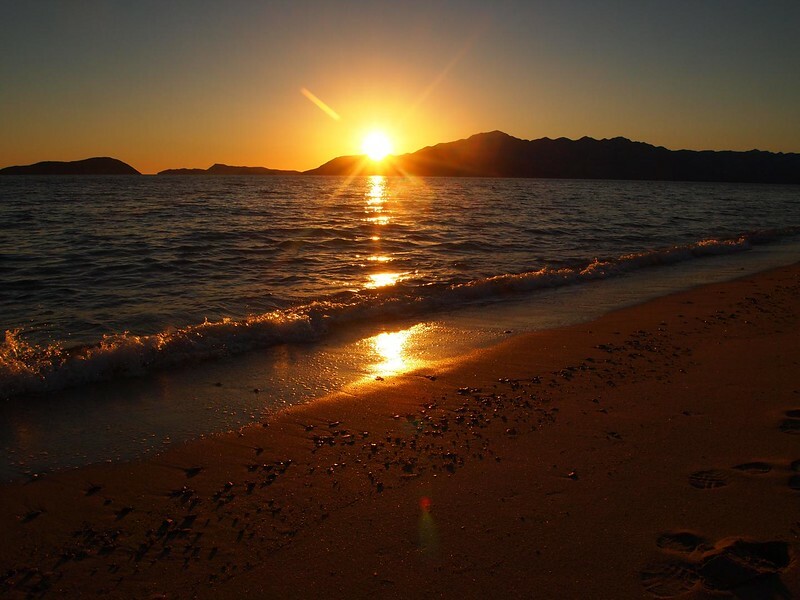 The sunrises in Baja are amazing, lighting up the Sea of Cortez and making some beautiful colors.... they're one of my favorite things to photograph. 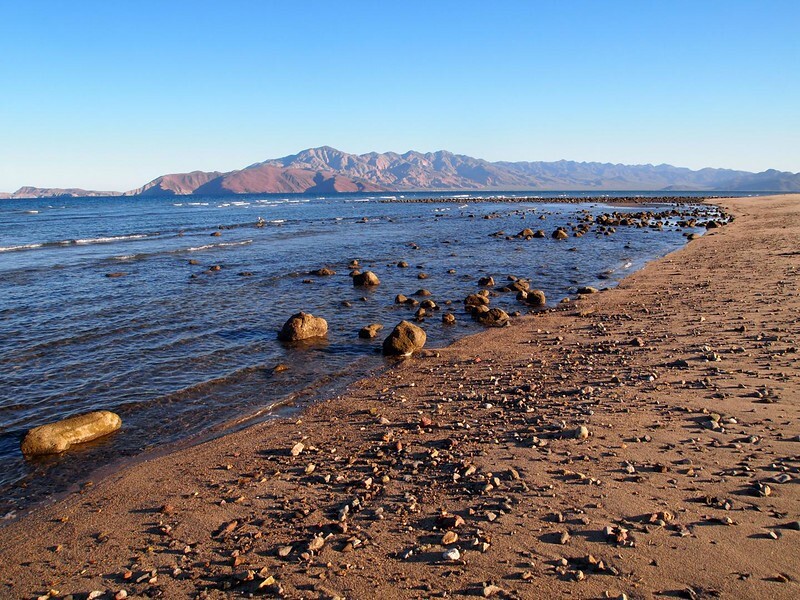 We did finally venture out and head 5 hours South, to Bahia de Los Angeles. 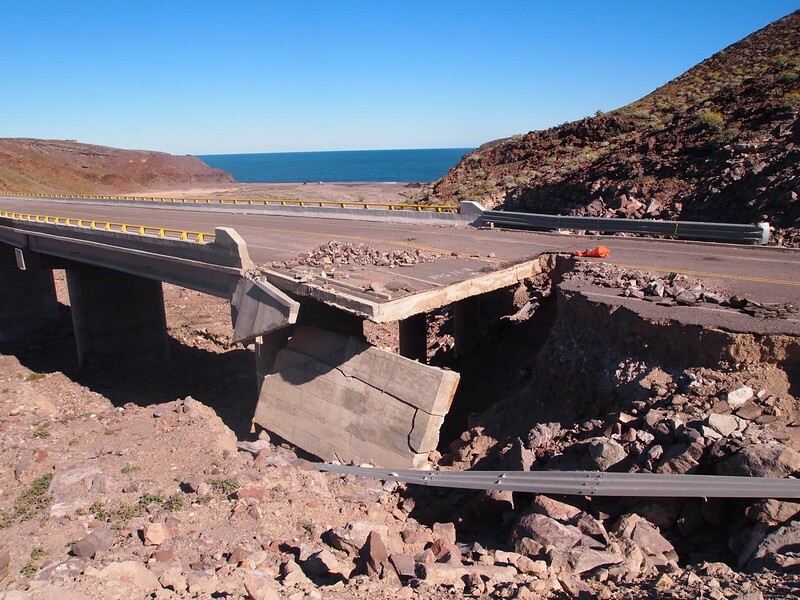 The attempt by Mexico to finish building a road from South of San Felipe and meeting up with MEX 1.... but it seems that mother nature by way of a recent hurricane is reclaiming any attempt by man to tame the Baja peninsula. About a dozen parts of road have been washed out and made impassible, some times totally washing away the road. There are temporary bypasses that have been built, but they can be pretty rough. We didn't need 4WD, but came close a few times. 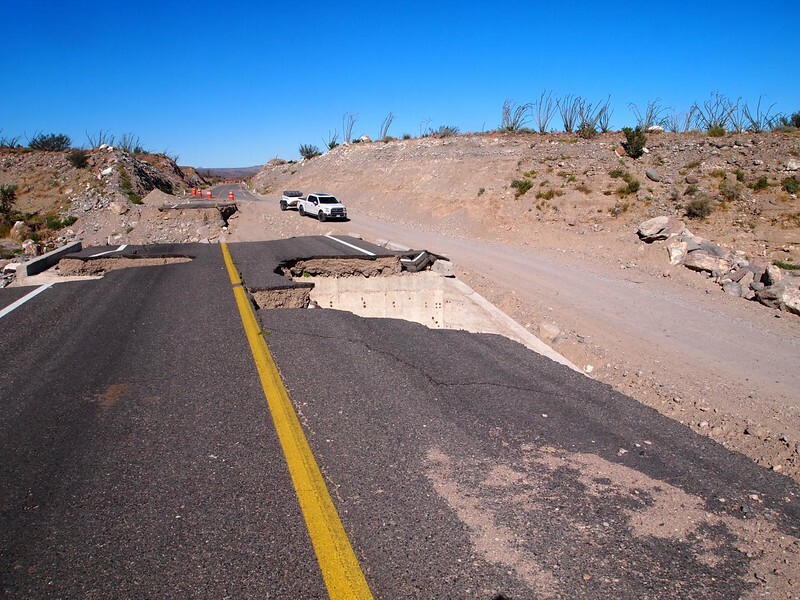 The road is simply falling apart down there, Mexico can't keep up with the repairs! Most of the damage is around Puertecitos and down to Gonzaga Bay. It'll be quite a few more years before the highway is repaired/completed, which is good news IMO... I'd love to see this part of Baja remain hard to get to. 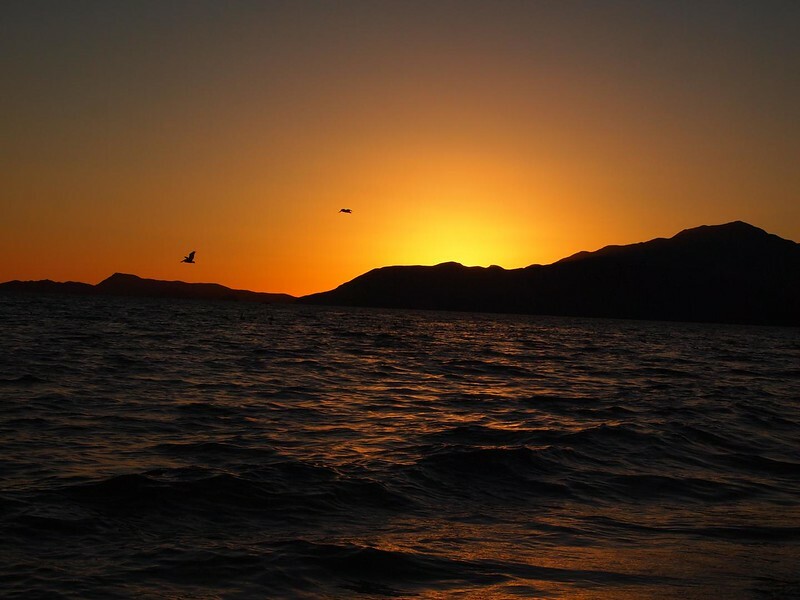 The Bay of LA is a out-of-the-way, sleepy fishing town with a beautiful bay surrounded by massive, barren islands. It's a place where Whale Sharks come to have their babies and there is plenty of other sea life as well. You can charter boats from many places to go fishing, whale watching, etc. 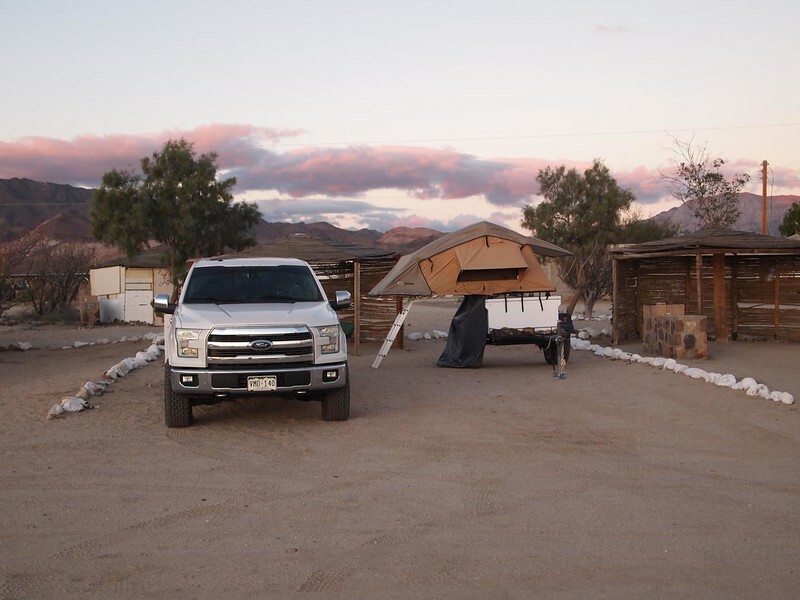 We camped at Daggetts where they offer palapas with fire pits and running water with toilets and hot showers. 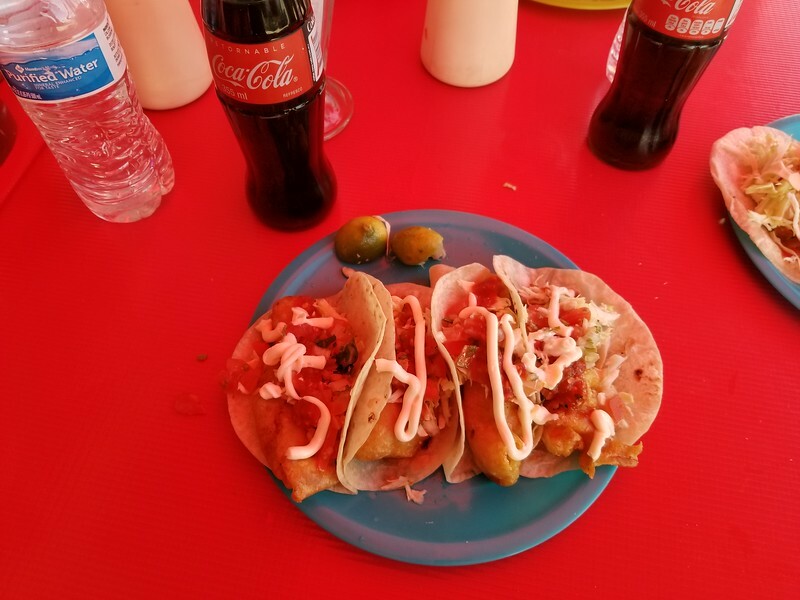 The facilities are sketchy and questionable, like many other places in outlying Baja.... but it does the job. 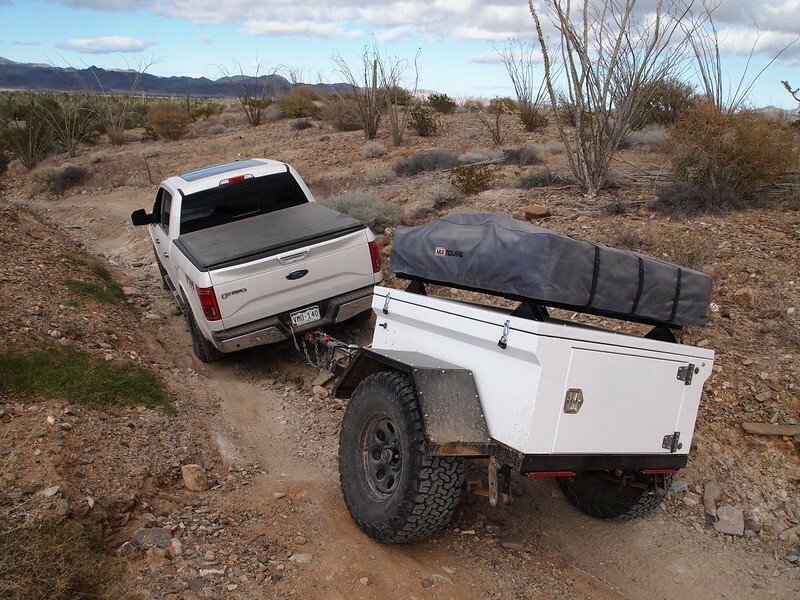 We dropped the OUT trailer and setup the ARB RTT, then used the truck by itself to run around town and explore. Random, friendly doggo (pit bull?) 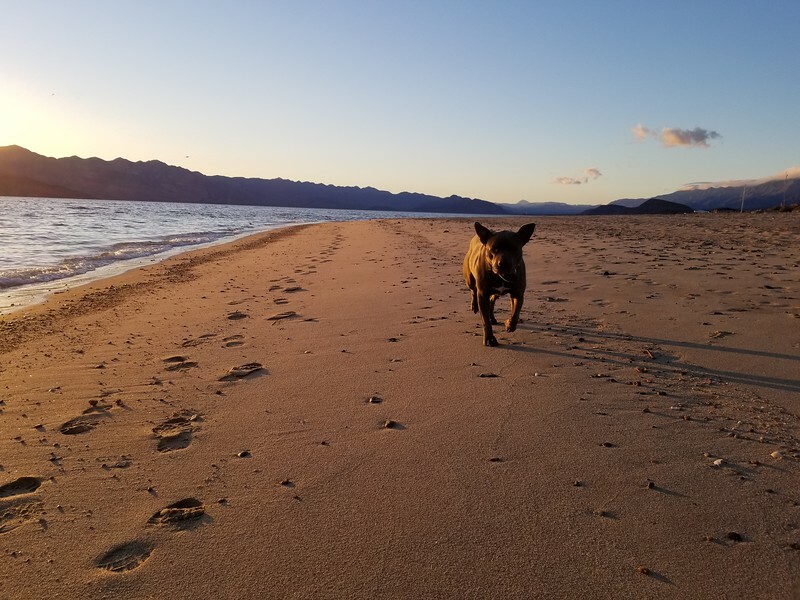 running on the beach.... I was taking pics kneeling down and she body-checked me, damn near knocking me over! Scared the crap out of me too, because I didn't see or hear her coming! She was super friendly and just wanted some attention. 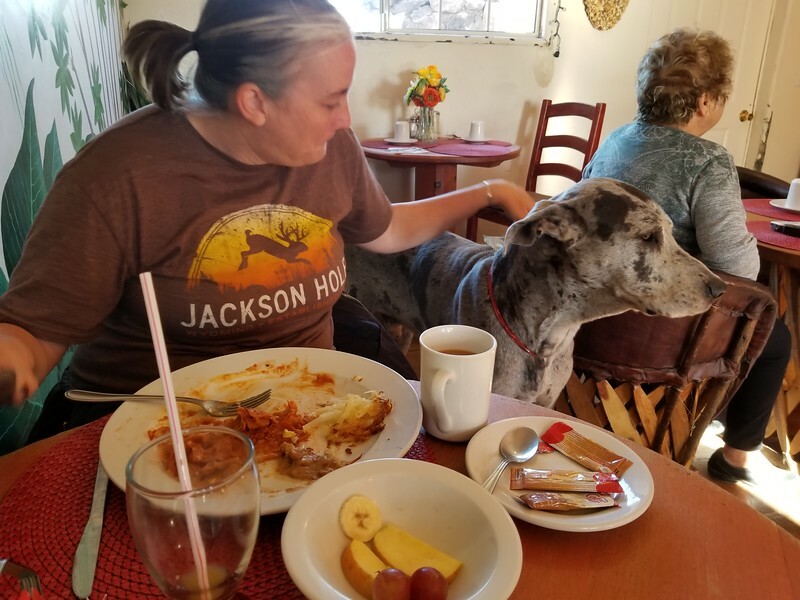 We had a great breakfast at Costa del Sol and got to see the one-eye'd Great Dane Scooby, who we met 3 years ago. 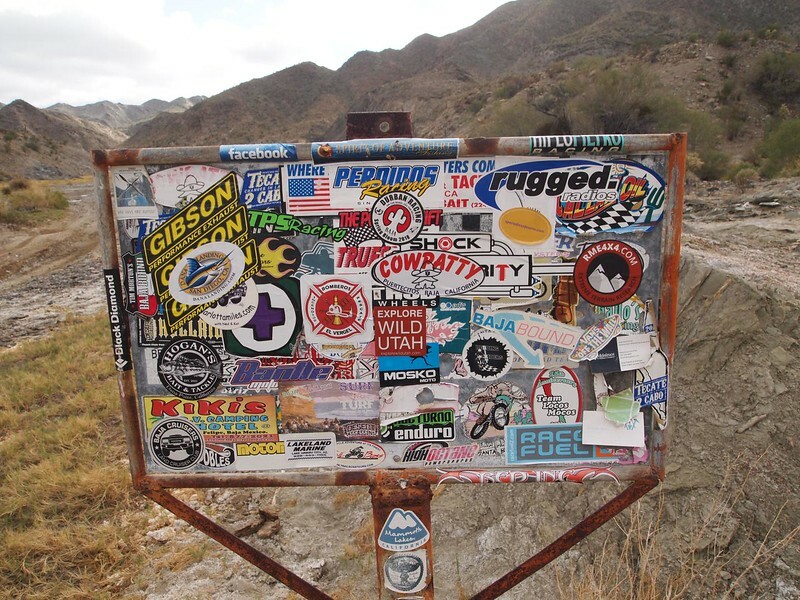 When we left the Bay of LA, we hit MEX 1 headed North and turned off at one of my favorite route.... into Calamauje Wash. The first time I heard about this place, I was warned to stay out. 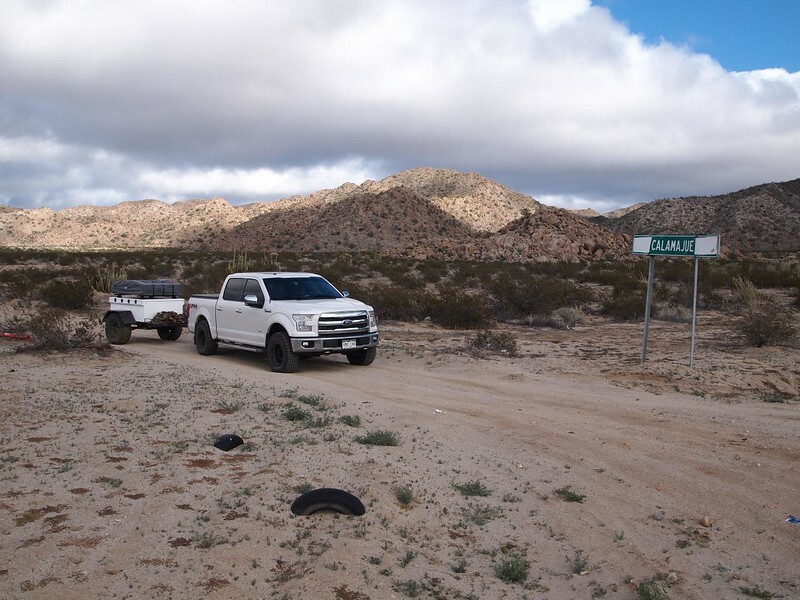 Deep sand, rough two-track and a wash that usually has running water and some deep crossings. The warning had the opposite effect.... I HAD to see it for myself! 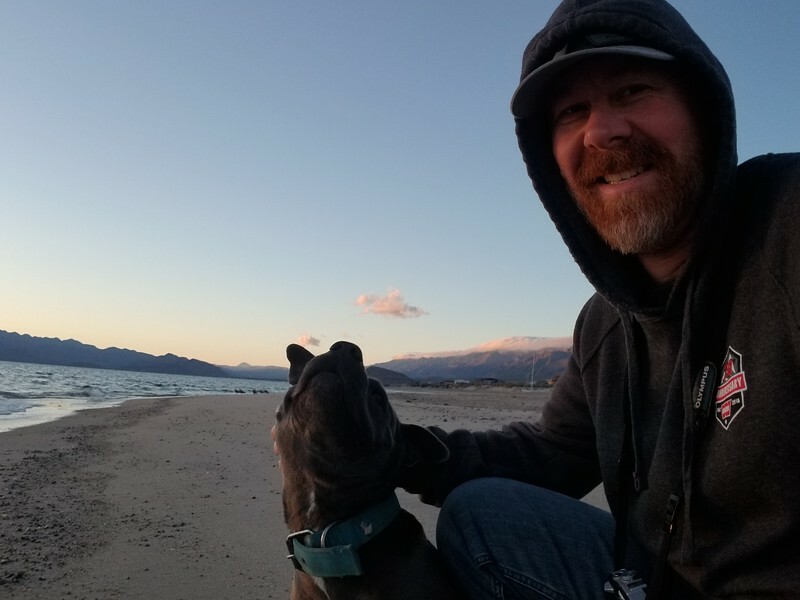 We've been thru before, 5 years earlier in the '98 Toyota Land Cruiser and is was SOFT, the Baja 1000 had just ran thru and churned up the sandy wash. This route can be broken down into 3 different parts, from the highway turnoff. The first part is simply incredible, massive Cirio trees, Saguaro cactus and the gigantic Cardón's reach nearly 100' into the sky here! 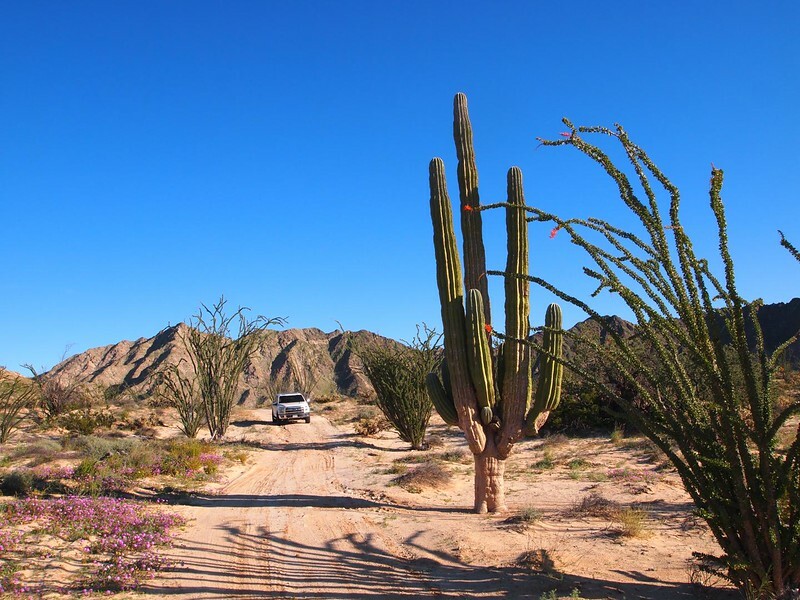 This is Baja's jungle.... and it feels like another world. 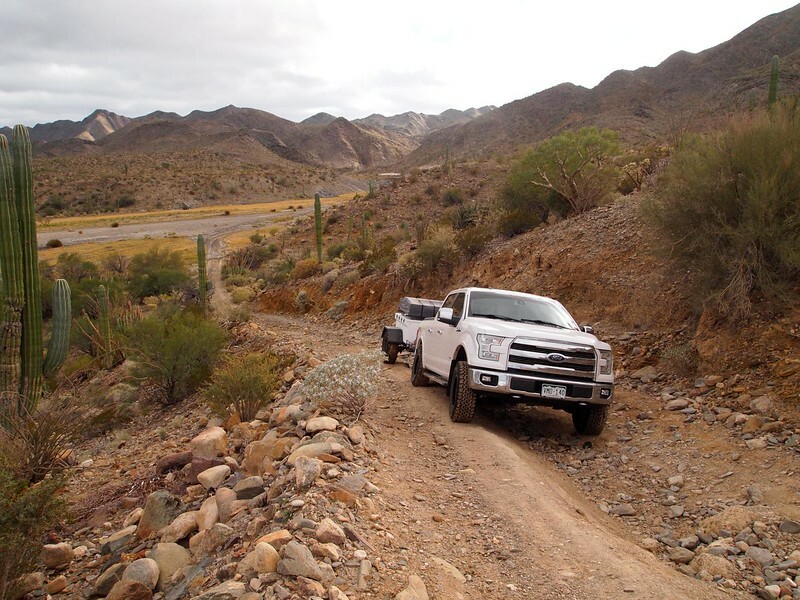 A whooped out two track stretches for miles, winding it's way thru the beautiful Baja jungle. While we were passing thru a storm moved in and it was lightly raining, which is rare in Baja. We were a little concerned, as dark clouds where hanging over the wash we were headed towards. The 2nd part of the trail is down in the wash, soft sand and running water have created quite the oasis down in the canyon. It's beautiful, the wash crossings are mostly tame but a few of them got deeper than expected. There are steep canyon walls and rock that has been carved out over hundreds of thousands of years. 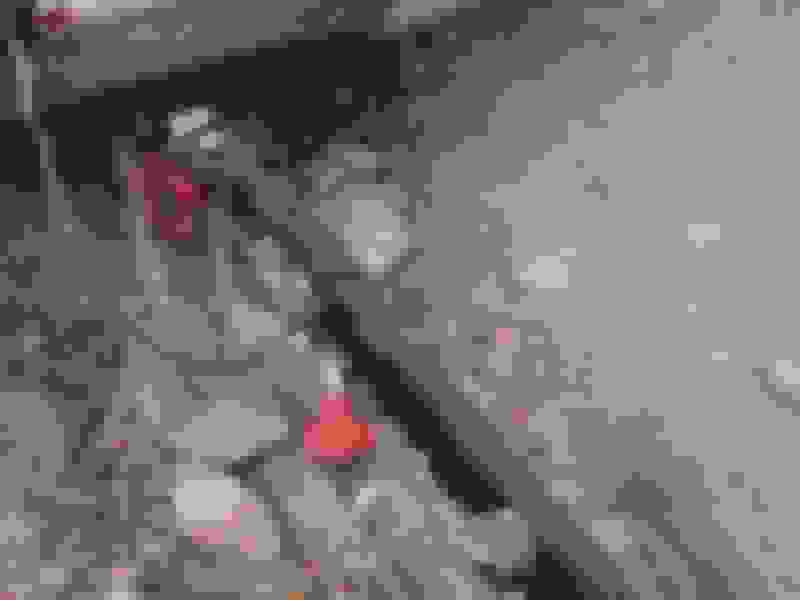 At one point there's a spring with minerals building up and cascading down the cliff. The last part of the trail climbs out of the wash and among the Ocotillo plants, it's very whooped out, diving in and out of rocky washes. It requires careful driving, but there are a few parts that you can pick up the speed. Eventually the trail spits you out at Coco's Corner and the more traveled roads and highway construction in progress. From there we hit the road back to San Felipe, getting to the InLaws place just as it got dark. We were tired and needing sleep, as we were heading to the border and on home early the next morning. 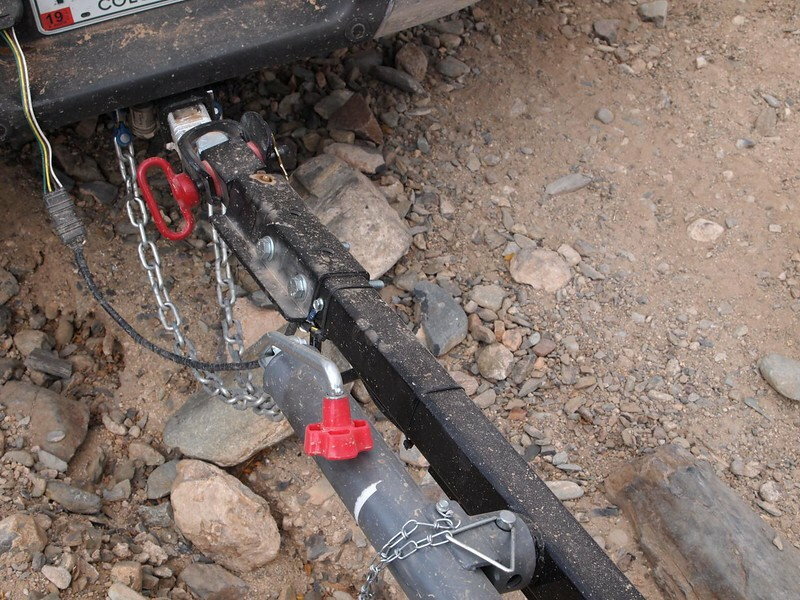 Does is have an articulated hitch coupler like the Lock and Roll product? I'm running a Max Coupler, it has a Urethane bushing and allows full trailer articulation without and binding or solid, clanking feedback. 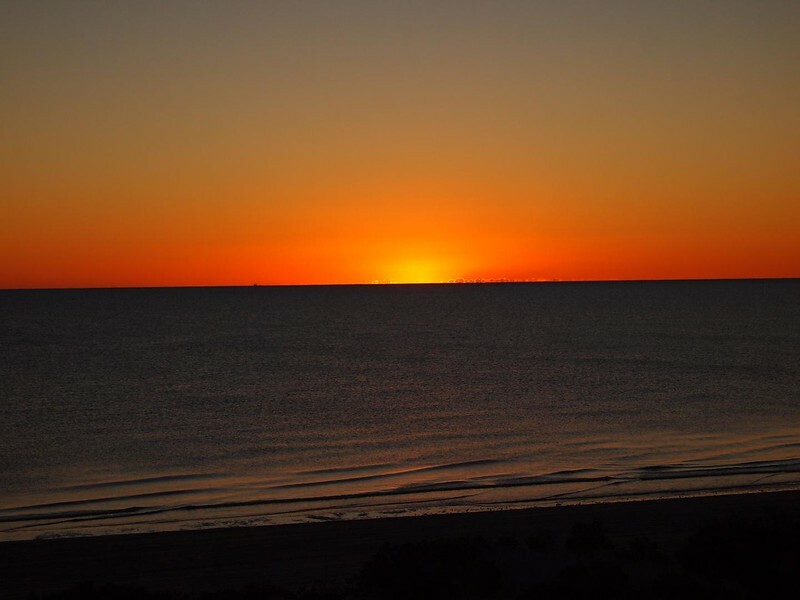 Last edited by [email protected]; 01-03-2019 at 04:33 PM. It was, we had a great time. Highly recommended, too! So jealous. Here in Kentucky we have great forest trails, lots of rocky washes out areas and plenty of mud, but nothing like this. That looks incredible. Thank you for sharing. Yes, thank you for sharing. I can never get out to these places, but i love to see the pictures and hear stories of the adventure. Gives me hope that one day i can do that as well.